As we all know, games we like can have bugs, especially those in development. I'll use this thread and encourage others to post their bugs they discovered here, so Hopfrog can easily view them. When opening a big chest The character (humourosly) responded NO STRING FOUND. Also would like to add that when eating item's to 0 creating a new section in the item bar, it then fills up with something you already have creating two portions of 1 item. Causes building issues such as lack of said item. Can be fixed by tossing the item's then filling the spot with something new the repacking tossed items. 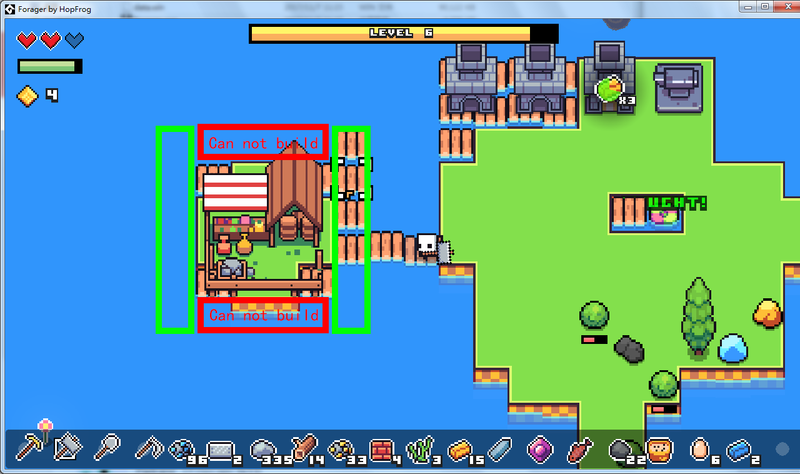 At times, stacks of wood will take up another inventory slot at random intervals (e.i. one stack would be 16, another would be 46, and the last would be 100+). When crafting, the lowest numbered stack will be read and won't allow you to create the desired item. This bug post is in relation to Alpha 5. Bug testing for Alpha 6 is currently underway. *objects such as trees, rocks, ores, etc. will grow within the same block. *throwing seed into tilled soil may cause it to glitch before being planted. *Having about 200 fish traps out with all saying "Caught!" will cause the game to be about 3 seconds slower in real time vs. 1 second in-game time. More bug posts soon to follow. 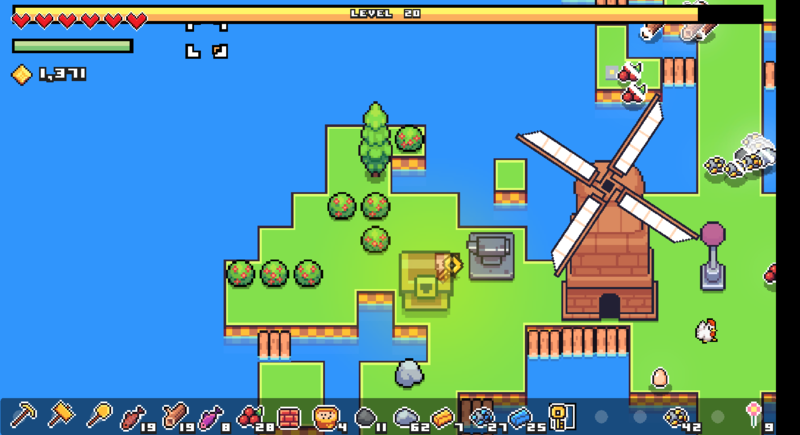 :) All bugs shown above are in Alpha 6. My level can't go any higher than 10. It just shows 288/288 xp and won't go any higher, no matter what i do. Is this because of humble demo? That's not a bug, is because this is the demo for the full game it's not like the Alpha versions. 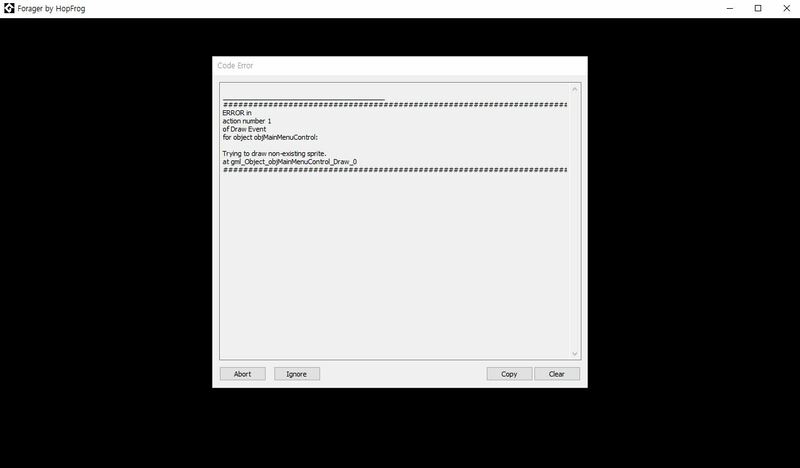 Game Crash when I have a full inventory and I want use a object. I've been having the same issue. I have a full inventory, and about two clicks in I get this. Game crashes when I try to clear a full inventory. Wheter by eating, throwing away, or using in a recipe, it seems that freeing a slot in a full inventory crashes the game no matter what. Meaning if you get a full inventory your save is lost. Can you fix them fast? That build error is the same as the inventory full error, at least it looks like it to me. The full inventory crash bug makes the game unplayable D: and i was really liking it. Hopefully the dev who works on this game is currently working on a bug fix. Hey! Found a new bug. I had 2 eggs and when I right clicked one of them, nothing happened but it made a sound like it did and it used it up. Then I tried the second egg and it gave me a NO_STRING_FOUND error and crashed the game. Like a dufus, I didn't screenprint the error log. I'll come back to paste it here once I manage to re-create the bug. I'm trying to make a tree saplings but it crashes -_-! 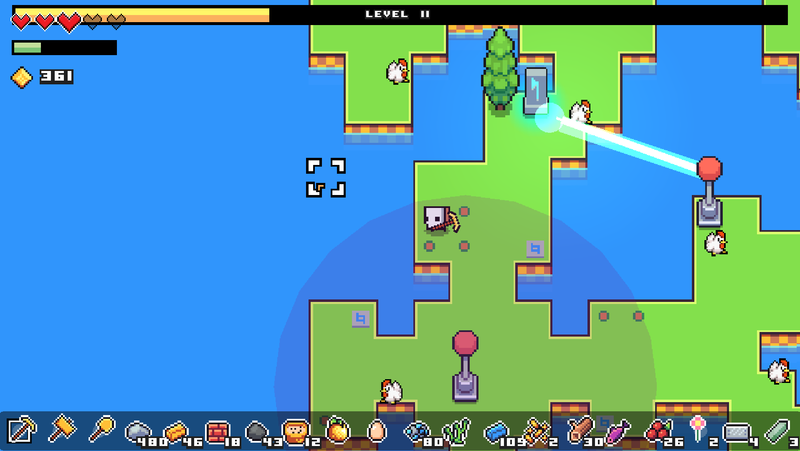 Just wanted to let you know that I am almost done working on these bugfixes. The new version (Alpha 5) will be available to download this weekend! Please susbcribe to this mailing list so it notifies you and you don't miss it! That was when I tried to eat the last mushroom. It did the same after loading it up again too. Also throwing it away does the same. (further tests) Throwing anything and eating anything does the same. Some pieces of the wheat are following me two islands away when I try get away haha. It really wants to be in my inventory! Ah, thanks for letting me know, that's awesome! thnx for Alpha 5 it fixed the full inventory bug. I know this is an ealy demo of the alpha but of the moment the game frezes every 20 second. quite enoying. fixed it by deleting both the old alpha 4 and alpha 5 and then reinstalling alpha 5. Your savefile won't get deleted by this process. the market bug also happend if you dropp all of your item in one of the slots. if you drop all the items in a slot all the slots to the right will disepear and the items in the slots as well. got this then I tried to learn the ""all the minarel gives coal. After starting the game again I hadnt learnd that and the game told me I couldnt choose another one, because I didnt got any points to spend. When playing Alpha 5, items in inventory sometimes disappears when other items are picked up. There is a 2nd bug which I don't how it happens but sometimes items in inventory wont stack and take up 2 spots which is really annoying. Alpha 5, whenever the last item in a stack leaves my inventory, some of my other items in the inventory disappears(they are still registered, there is just no way to see them or use them in ANY way), and it only reaprears again if I get a full inventory. What also happens because of this is that my inventory gets all messed up, as an example, my bricks disappears thanks to this bug, and I pick up a new brick, I get a whole new stack of bricks, if I have gotten my inventory back, this new stack is the one prioratized if I want to pick up more bricks. Also, the stack of bricks that came back with the rest of my inventory is connected to the other stack. If I hold the bricks that has disappeared and reappeared, and try to throw it, it will throw the new stacks bricks, if that stack of bricks becomes empty and I pick up a brick again, everything is fixed, as if nothing happened, except for the fact that ANOTHER part of my inventory disappear since I threw out all bricks. This "works" with all items except for the tools(I think). I hope you understood what I meant and hope it gets fixed in the next patch, since I can't play the game until it's fixed. This bug could be because I moved my save to the Itch launcher(didn't know about it untill today) from my "normall" download file, and re-installed the game(keeping my saves but updating the game) since I heard that the full inventory crash bug was fixed. Hey everyone! 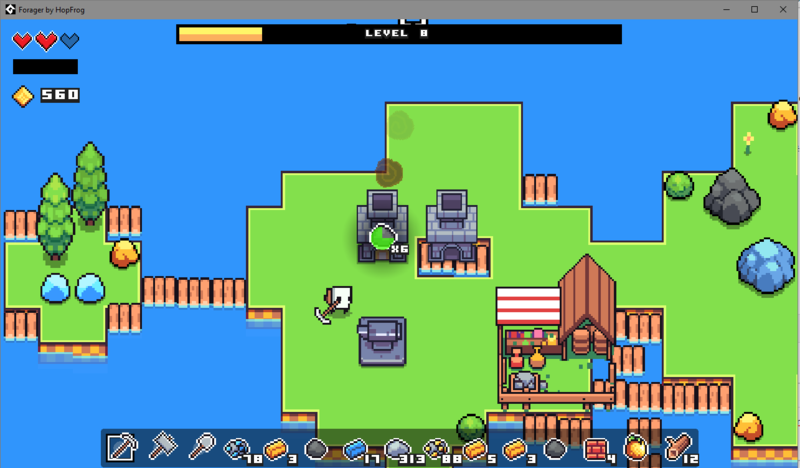 Sorry about the problems with the inventory system, I know it's annoying and frustrating. That's not the inventory system that we will have in the final release on Steam, but meanwhile I will try to fix these bugs as they come up! when will it be released on steam and for how much. Will there be a discount for us who had helped you finding bugs/sponsoring you?? in Alpha 5, the inventory is buggy too. When I now eat for example the last berry in my inventory the item after the berry or at the last inventory slot will just disappear, it is all lost then. Additionally the item stacking is not working fine in alpha 5, i have gold bars in 3 slots. Look at the image. I had a bug where i had 2 stacks of wood and one had 200+ in and another had 1, i think the game didn't recognize my wood in the larger stack and didn't put it into the smaller stack, i couldn't really progress as i didn't really want to wait for coal to respawn. Items just didn't stack properly spreading out into many slots, also wondering if there's any way currently to store items? Two inventory bugs. Items stack weirdly. My gold ingots for one, would stack up to 32-36 and then make another stack of 6 and then another stack of 100+ I've had this bug with all items though. Not just Gold ingots. The second inventory bug is that half of my inventory bar will just randomly disappear, causing anything that was in that portion of the inventory just deletes. The System button doesn't work. Easy as that. I can't exit unless I manually close that game. I've only played this game in one large sitting because I don't know if the game autosaves. Those are the only bugs I've had so far. I would really love to see this game grow into full amazing game so please fix them! I've found two major bugs. 1. Inventory bug. I've heard other people talking about this, but I think I know what the problem is. 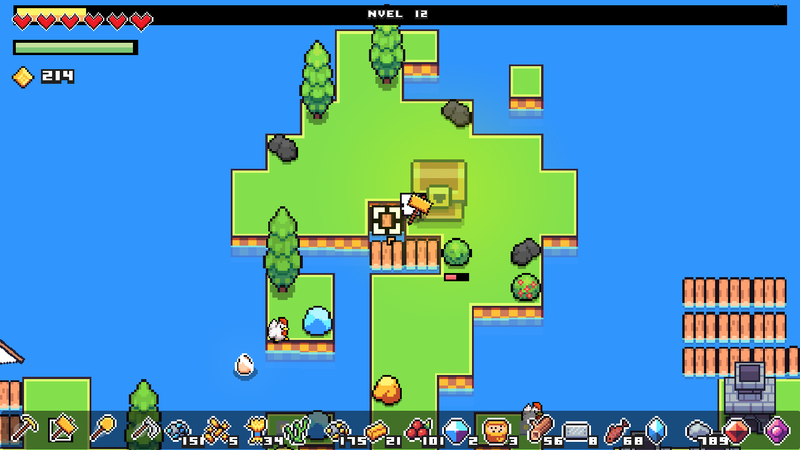 The inventory grows as you collect more items, the problem is, the growth seems to be based on exactly how many items you have. So if you have 20 different items, you'll have twenty slots. The problem with this is that if you get rid of a stack completely that isn't all the way to the right, your inventory will shrink down anyway and you won't be able to use or see your rightmost item anymore. Get rid of a few slots at once, and you can lose several valuable items and stacks of items. Whats worse is that if you collect the same item that got lost in your inventory, it wont stack properly, meaning that once you fill your inventory up again, you will have two different stacks of the same item, which causes its own issues. This can make it seem like your items are disappearing at random. You could fix this by either adding an exception so that you will always be able to see up to the slot that has an item in it, or making items automatically move to the left. 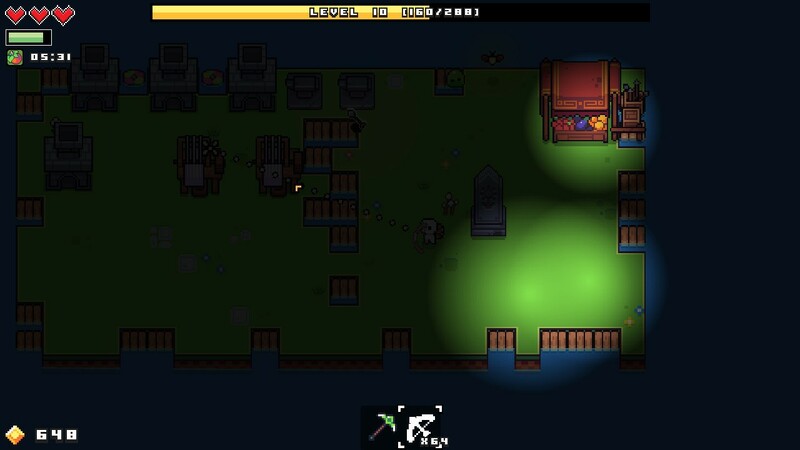 Or just not hiding all the extra inventory slots at all, and have them and their empty circles visible at all times. 2. Save bug. The game can save into an unwinnable state. I had to restart because my first game autosaved on a game over screen, so every time I load it, I instantly get a game over. The game is effectively permadeath. I think this may cause the crash when inventory is full as there could be the possibility that the inventory is full but the last item is invisible because of the bug, so when you pick up a new item, it doesn't say inventory full because the last item reads as missing, but then it adds the new item and the last item and then there is one more than the maximum and the games like, oh no that doesn't work. - Inventory issues where it makes 2 separate sections for the same item. Such as ill have a spot with 8 iron and another with 1 and when i craft it will only read the pile with 1. I have to throw them all and re collect them to fix this. 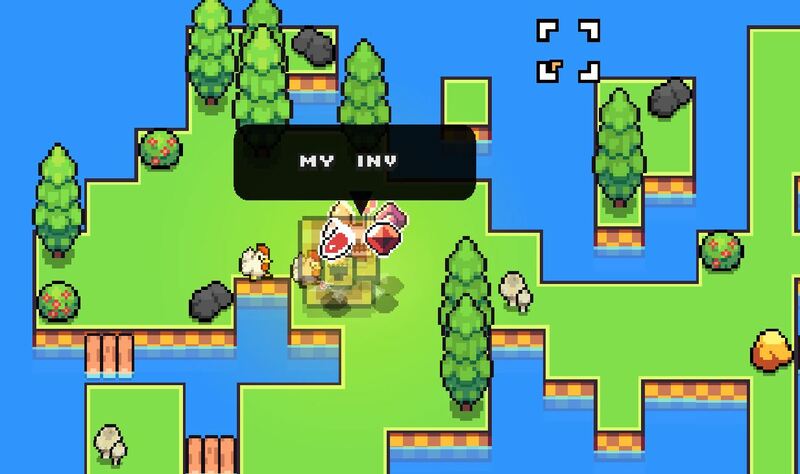 - inventory vanishing periodically and reappearing. Almost like cropping out my inventory..
-mills and other buildings requiring oddly specific spots for placement. mills most often will place only when on 1 square of water? -Is there a way to destroy furnaces and forges? Right now the only way i have been able to destroy them is if i place something in them and then hit it while the item is loading. Thanks for the bug reports everyone! I am working on updates! 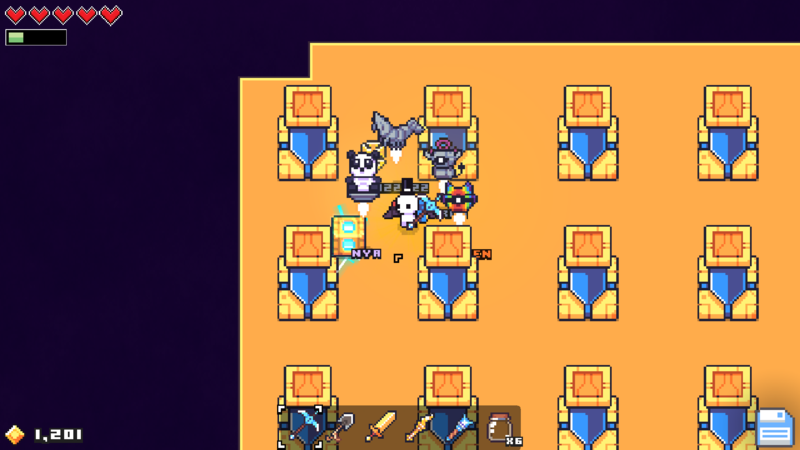 I got a chest by putting the gems on the squares but when the chest spawned in on top of me and I can't move. Please fix this, because I would hate to lose all my progress. i dont know if this has been noticed, but an object an spawn on another object. Destroying one of them will make the tile walkable despite another object occupying the place. Somehow I am getting a single Iron Ingot added separately to my inventory bar. When I try to build something it says I only have 1 Iron Ingot. Cannot Build anything that requires more than 1 Iron Ingot. Happened in more than 1 game-save so far. Interesting for sure - these things happen - Love the game so far! Download alpha 4,run it,throw out your ingots,pick them up,all good. I'll just be playing the game and then i'll use up all of an item and then more items just start disappearing from my inventory and then they'll randomly come back. i really love this game and i think it could be amazing with a few bug fixes. Sounds like it could be a corrupted savedata issue. Have you tried deleting all savefiles? 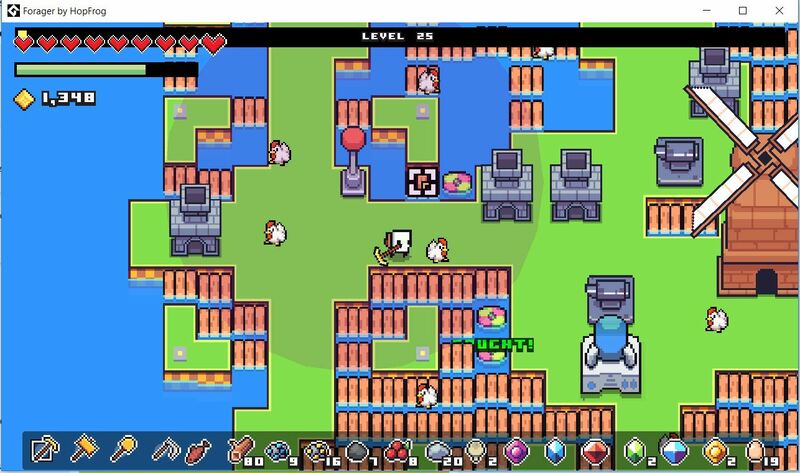 It appears that if you put Forager Alpha 5 onto a flash drive, your save files will NOT move with your between computers. If you start the game (all game files on a flash drive), shut it down, and boot up the game onto the second computer, you will have no loaded save files. However, the save file on the first computer remains: they just simply do not transfer between computers. Savefiles are located in "C:\Users\USERNAME\AppData\Local\Forager". If you copy that Forager folder into the new computer in the same location your savefiles will transfer properly! Which alpha did you try? I meant which alpha did you test the bug on? edit: it keeps happening when i try to eat/use something that only have 1 of it in my inventory, like berries or gold bar. My inventory is full and i can't pick up anything else and can't empty any slot now. 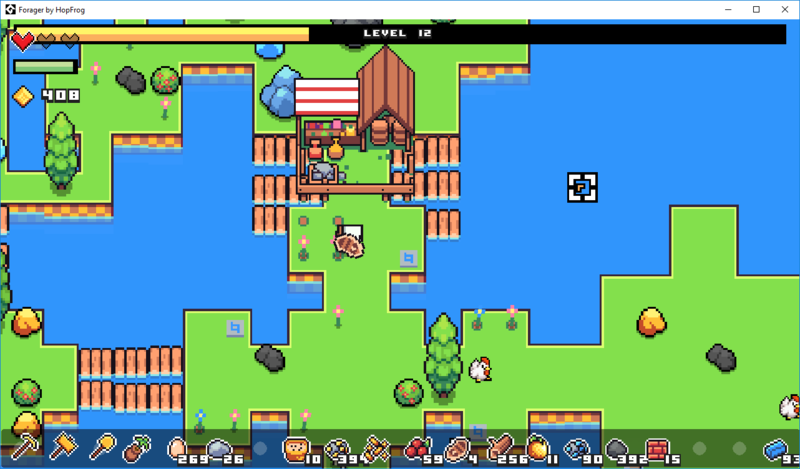 So far I've encountered times when I try to cook a fish and it says I have a negative number of fish and also one of my bridge tiles are bugged and I can't walk over it. 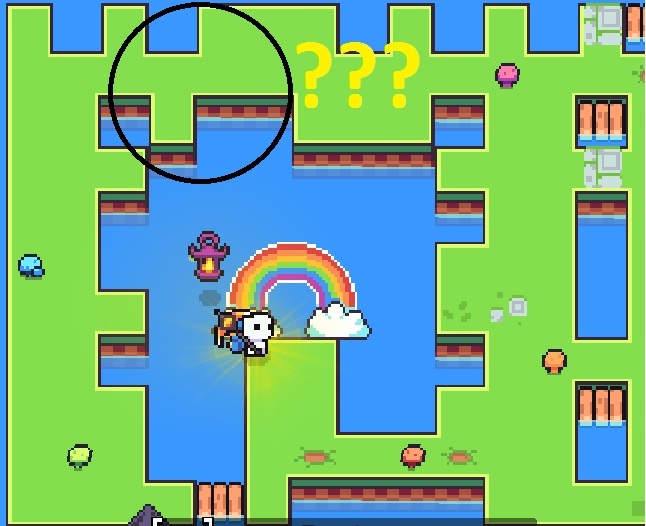 I can walk on the "empty" tile below it though and can not build on the tile that the original bridge occupies or the "empty" tile below it. 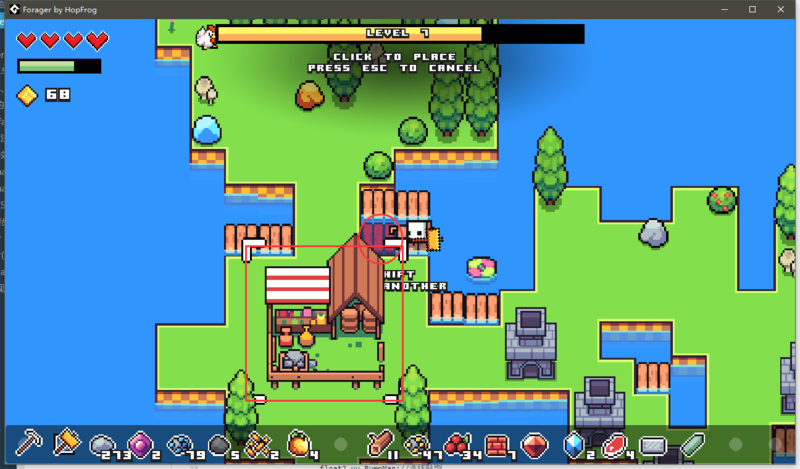 Also, if I zoom the camera out and click on a building that produces a menu the camera resets (this may not be a bug but it is an extreme annoyance). Like a couple others have reported, a chest has spawned on top of me and I am unable to move away from it. Any fix for this? I'm at level 15, and am bummed that I'll have to start over. First of all, congrats on the amazing gameplay! It is original, simple, addictive and offers many hours of play content - everything you can dream about. (on alpha 4, not sure if it is resolved) The 1st chest I found was just on an island, but further I unlocked 2 islands with the 3 gem-spots. Filling the same blue gem on both (1st then 2nd island) made all spot from both islands disappear. Choosing an inventory item by clicking when you have an item equipped (other than a tool) will throw the currently equipped item to the spot behind the inventory bar. Stone roads don't cost anything (the 4 stones don't get subtracted from your total). Furthermore, they don't seem to serve any purpose, plus after saving and loading again they all disappear. It is not possible to build bridges behind buildings and sometimes close to mining rods. Might have disappeared with alpha 5, but a few times I saw two trees or one tree and one stone spawned on the same spot. The well-known inventory bug : if you empty a slot in the middle of the bar, the last slot will disappear, even if it is filled (let's say with gold bars). If you then pick up another instance of this item (the gold bar), you will now have 2 stacks of gold bars. Trying to use them will always result in emptying the spot that is further to the left. Muardin's post sums it up pretty nicely. The only work-around is to empty this slot, filling it with an item that you don't already have until making the 2nd stack appear again. If you pick the dropped items back up, they will stack correctly. Coining is not a good return on interest on the long run : trading gives more. In the same way, crafting isn't always interesting when you keep in mind that the main goal is buying new land. > So it is better to sell wood than coal. Very late announcement when starving. 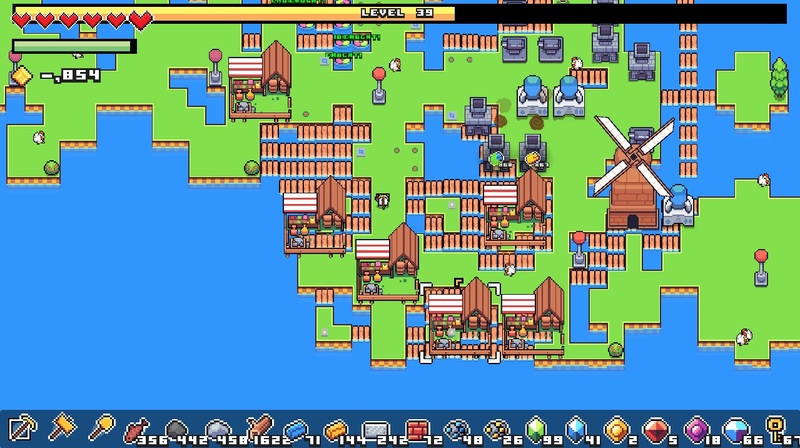 After level 14 or so, the demo pretty much offered all that is to do, and you have to spend an exponentially increasing (huge) amount of time for buying the next land. It would be nice to be able to quite the leveling menu with "E". As indicated on the furnaces & co , ctrl+click crafts the maximum amount of items with your available ingredients, while shift+click does the half. The interesting part here is that you can also drop/sell items the same way. Be careful on not creating too much sprites. To live on with the inventory bug (alpha 5), just keep all the spots filled with at least 1 item as placeholder ; just leave the last spot open for items that don't occur often. Keep up the good work, loving it so far! Can't wait to see updates and the final game! PS: what is the generator for? Generator speeds up other buildings that craft. It would help to have that said somewhere in game, and by how much since I don't know. Thanks for the info, I didn't notice that much of a difference though. Might be in the 10% range? Thanks a lot for the great feedback! This is insanely useful! So the maximum possible efficiency for Forges/Furnaces is 330% and for every other building is 310%. Another cool thing to note is that Generators also increase Mining Rod's attack speed! Thanks a lot for the info! I'm just glad it could help, gonna try out the alpha 6 pretty soon. I really see a lot of potential in your project, and the work in progress sounds like tasty stuff! Congrats on all the improvements on the inventory, I can't wait to play the steam release! I have played to level 40 last night. I have some thoughts. First, I consider the market fairly cheaty for gaining levels - once you have the sales price upgrades and the selling = xp upgrade you can buy and then sell high value items every 5 minutes, times however many markets you care to build at only a slight loss on some items, and a gain on yet others such that you can gain XP very quickly and gold at a slower pace but still positive. Since this is scalable, I view it as an exploit. Gems appear in stacks of 30 or so in market. Keys appear in stacks of 20 or so in market. I think their appearance is level dependent not just getting the "stores have gems" upgrade. In any case, keys are 40 regularly and gems 60, and can be sold for about the same. With several markets I can level up every 5 minutes provided I had a good stack of gold (like 5-10k) to start with. This is vastly superior to any other XP gain method I have found so I am going to say probably an exploit vs. intended balance. 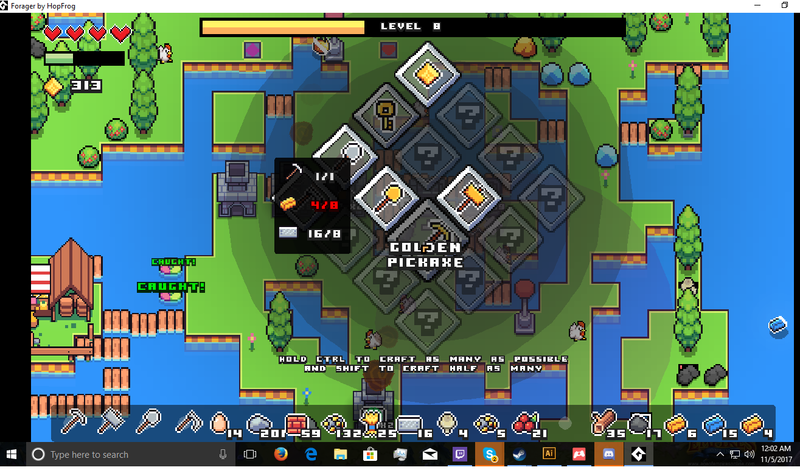 When selling 30-60 gems or 40+ keys, the resulting stack of gold is extremely laggy until I pick it up. No crash yet from this however I'd recommend as others have to spit out a 10 or 100x coin object when selling if the sale exceeds the amount, as lag prevention. I do see lag from the world as it grows, if not picking up items constantly from the mines. Some method of picking them up from mining automatically, perhaps into a chest or something, would reduce that problem, or consolidating items into stacks. Another thing I noticed is the ability to walk inside building tiles that are on top of rafts, meaning the building is partially solid. Rafts and roads can be spawned mid-block, but should probably snap to the closest tile visually. I haven't figured out what the function of the roads is, but I was going to test if I can stop resource spawning with them everywhere except a couple of areas where I want to concentrate the spawns for mining. Finally, if you plan to implement the combat, a pause feature is essential. Right now only going to skills seems to pause the processing. Toggling with say "P" is an easy way to do that. I did notice you don't consume energy when not moving or performing actions so in the current mode it's less of an issue to AFK. Also, would like it to not reset my zoom level every time I interact with buildings. I read in another thread that the roads are purely for decorative purposes as of yet, but they're intended to speed up your movements and/or diminish energy consumption later on. Just unlocked enough abilities to read them all. There are many not implemented, but there are a few near the corners of the 8x8 grid that are working that require those unimplemented upgrades to get to. Nothing mechanically different mostly bonus to XP or health or crop speed, etc. Found a bug in Alpha 5 where when you left click on the market with an empty slot selected a 'player' icon is thrown and the inventory drops by one slot. All slots return next time the player picks an item up. Just tested alpha 6, and after 30s I noticed the last item you get just disappears . i keep grtting this how do i fix? After solving a puzzle (matching gems to the icons on the floor) my inventory froze, it collected the gems (which filled my inventory) and I was unable to throw/use any items until I reloaded the game. After updating to alpha 6 My game is frezzing and it takes around 1 second until I can move again. the frezz happends every 10 seconds so its very anoying and makes the game unplayable. Have a good gaming pc so the computer isnt the problem. happends on all my saves and I started a new save but the frezzing still happening. How can I fix it? deleting all the save file? if so, where? Pardon me posting my video over here (feel free to delete if it's an issue!) but I'm running into an inventory issue with Alpha 6, and being that I ran across it mid-video, it's easiest to explain this way hahaha. It would seem as though for large resolutions, the cost of buildings tooltip is outside the window to the bottom right. Worth noting that the game is not fullscreen, just being played on an ultrawide monitor(3440x1440) at whatever resolution the game launches by default. I didn't even know that existed. I spent an hour loooting random things trying to figure out what the recipe to make the market was. On a 4k monitor. 1. building/crafting item requirements overlay is out of the window frame, so basically player cannot see what is needed in order to build or craft. I dont know if this may just be me. on 4k monitor. 2. system menu does not load. 3. when having a tool and craft the same tool again, there is no way to drop or sell the extra tool. 4. maximizing the window causes crash. My game is crashing whenever I buy the "Supply"-upgrade and proceed to click on the market. However, when I restart the game I spawn in and don't have the upgrade anymore (which is not a bad thing since I've been able to continue with that save file). When using a bottle (both empty and filled) the item slot-selecter jumps to the rightmost item slot. Not gamebreaking, but disorienting and annoying. Was able to pick a gem up after throwing it on the correct "gem tile". It still activated, and I could sell the gem as usual. When filling the rest of the tiles I got the same gem back again, and this one was also sellable. When I started playing today I noticed that all my buildings were severely damaged. It's been at least 15 hours since I last played. Also, when trying to repair furnaces, forges, mills and markets it just opened up their crafting/buying windows. I figured out that if you start a crafting process, you can't access their windows and you're able to repair them. This does not include the market obviously, still haven't figured that one out. Alpha 6-Just happened after i brought the supply power and went to the market. Thanks for the bug reports on Alpha 6 you guys! You're welcome. :) Please be sure to update the game so we can test Alpha 7. I've had this error before. Too many entities on screen and the computer can't keep up. 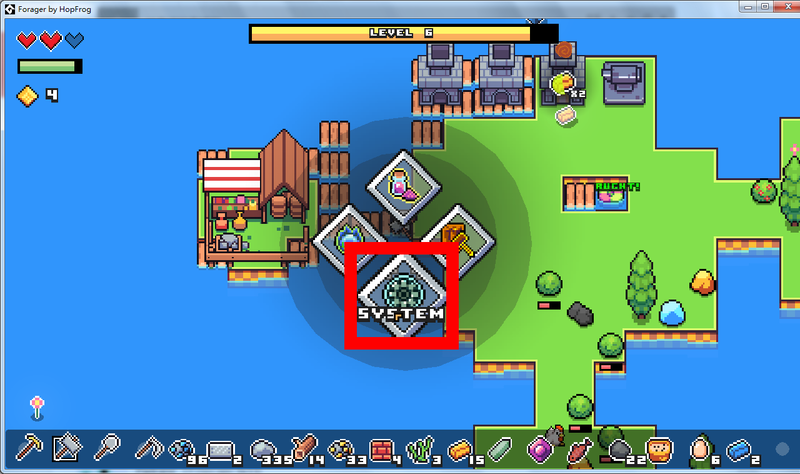 System button is not yet implemented. It may be implemented in a future build of the game. Craft Item recipe is not visible. Window with recipe is not visible when move cursor above inventory item. Just downloaded this cool game, Alpha 6, but i have only ocean. character and Hud are fine. E Menu works. but there's no land. Any thoughts? Try reloading the game or starting fresh. Welp played for an hour and a half, ended up getting stuck under a treasure chest. Was a fun game lmao. Cant wait till the game comes out without bugs involved. I down loaded alpha 5 and that fixed my no ground issue. I played a little while in A5 then opened A6 to see if there was ground. My save carried over and everything worked but the items that were disappearing and coming back stopped coming back so any invisible items would still get picked up only to be deleted immediately. I was only at lvl 8 so I tried a new save file. 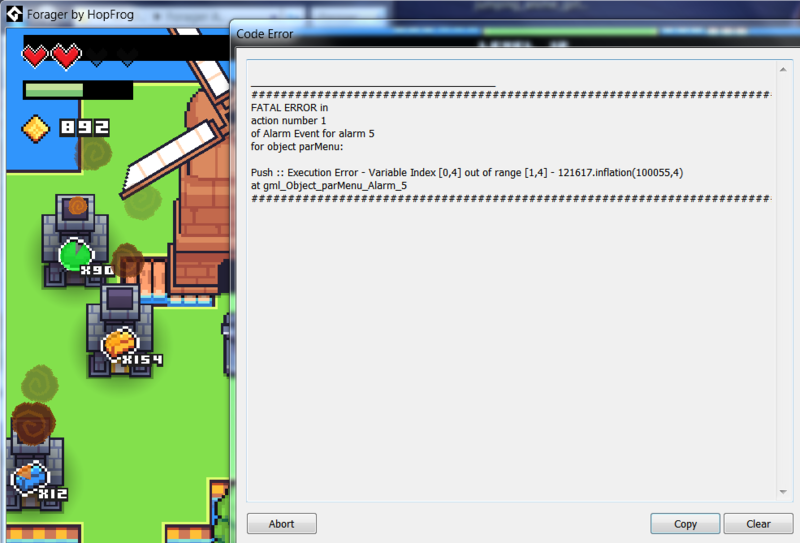 right after the first lvl up i got a fatal error. Still very excited to see progress made on this interesting game! This happens immediately upon load of the main menu, upon choosing ignore on the error report, it will load a new error every time the main menu animates. I had played on a save on alpha 3, and recently updated to alpha 6, alpha 6 had succesfully recognised there were previous save games, but was looking for game objects that have since been renamed or are no longer used. The solution for windows was to go to the save game folder (C:\Users\username\AppData\Local\Forager) and delete any previous saves, seemed to be the only thing that worked. I start game. Screen is small and windowed. I press F to make it fullscreen. Game lags in full screen for some reason. I press F to make it windowed again then press the maximize button to make it large and windowed. Can be repeated at will. I'm new here so if I am missing something please tell me what else would help. I have encountered one bug, when spamming food, it adds the "white" bar to be refiiled from the point it is "green" and not from the point of actual to be "white" refillment. Therefore, when spamming food, you lose big portion of it every time (for big foods like cooked fish etc.). The same goes when you used water bottle on tilted dirt. Also, is there a collation of bugs like a spread sheet or something. Might be better if we have one to limit duplicate report or something. Thanks for the game btw. I just revealed a big chest and it spawned on a tile I was in and now I can't move anywhere. Dying didn't change anything. I also tried building a forge to get a key to unlock the chest, but I am unable to build anything. It just scraps the build and drops the resources as soon as I try. I was able to build bridges though. Think this world is completely hard locked at this point. Just downloaded the demo and tried it out this morning, found that I couldn't eat at all unless my character started complaining about being starving. Even then I could only eat one food item and it went back to not letting me eat. 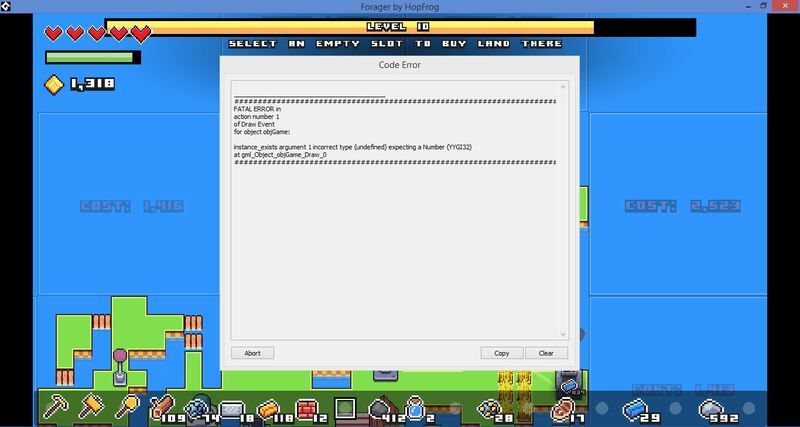 Probably easily solvable by checking if target isn't null when mining..
Error Occurs when you hit a tree (unsure if all objects) at the same time the mining rod hits a tree, it was at the last hit and the game crashed. In the demo, when you crash while entities are on the ground/white xp that's being filled up, you lose the entities/xp. No idea if anyone already said this or not xD. Two bugs. First happened when I was an hour or so into the game and a chest appeared after a puzzle on top of my character and I was stuck inside of the chest, thus ending my game. The second came in the form of an error code when I was only 20 minutes in and just walking around. -If you ctrl-buy somthing in the market you can go to negative money. This doesnt crash you, but its obviously a problem. -You can ghost through buildings build on bridges. -If theres a "pressure plate" from a puzzles and a trees spawn onto it messes up the hitbox a bit. -On occasion a rock and a tree stacked up, seen it a few times, idk when it happens though. -(Is this a bug?) You can more or less farm exp, if you have the "taxation", "gemtrade", "trade" you can just buy gems and sell them for exp. You lose a bit of money, but nothing compared to the exp gain. This Error happened when i had 3 heart containers and had 2 heart's, and my food was 0%. Not really sure what's caused this, but the game is no longer showing item requirements while crafting. Same result when starting a new game. Edit: Deleted and redownloaded the game. Same problem. Edit 2: Removed all traces of the game from my computer, including all registry entries. Problem persists. Tried compatibility mode for win 7/8, and running as admin. Problem persists. I got this while selling items. Maybe I sold too many? Game breakning bug. When I solved the gems puzzle, I was cauth where the chest is unable to move at all. Even when I reloaded game. Same happened to me just now, i was doing gem puzzle. Need a chest or some sort of storage, Tossing items in the ocean gets old, and very my items causes game lag. # After gaining level, enter the skill tree, when putting the skill LAMBERJACKING the game breaks, and to the initial again the skill is not enabled, and its point to habilitates no longer exists, having to add new level to try to talk it again, breaking again not being able to qualify. The same error happened with the skill, SUPPLY. # Character took half-life damage by cutting a wheat with the pick, as life was below half, thus causing a heart to lose. * Sorry for some error I'm Brazilian and I do not know English very well. I can not move anymore because the chest was created in the same area as my character was. I was doing gem puzzle, and i was standing in center when i completed the puzzle, so when chest appeared on top of me i got stuck and cant move. I tried to build anvil next to me so i could make a key but building material just dropped on ground. Hello! I have a very small minor bug that wont happen to very many playing the game correctly. In Alpha 6 when filling on cherries (i would assume it works for other food items) if you spam right click to keep trying to consume the cherry. 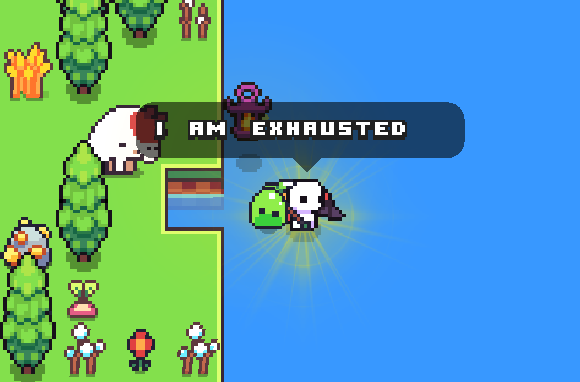 The moment the game allows you to eat the cherry and fill up a bit of your energy, you can keep on spamming right click to keep eating the cherries and it will waste the cherry without giving any energy. Not that large of a bug, most likely will never be found during a playthrough, but I thought it would benefit posting this here. I think this might be part of the game. You can see it best when you eat cooked meat. If the white bar isn't entirely depleted, you won't get all the energy. I'm not sure if it's just me, but the 'system' wouldn't open anything and the save/load function that looks like it's been out since Alpha 4 does not work for me. got this error when i was in the by land meny? 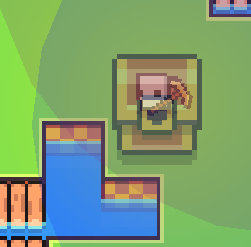 when a chest spawns and the player is in the same spot you get stuck. placing structures is also difficult in that situation. i found a bug where if you eat something like fish which gives you a lot of energy and immidatly eat something like berries wich gives you less energy. then you get not the right amount of energy back. 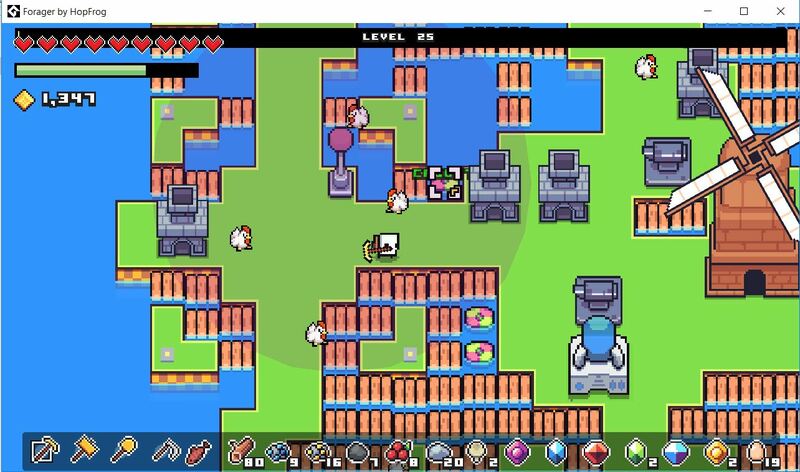 I was able to buy all items of a stack at the market by pressing ctrl and left mouseclick. Sadly i did not have enough money to buy all the items. Now i got a negative balance. Another thing i noticed is a huge amount of lag when the number of fish traps is pretty high. The lag appears when a larger amount has cought something. i have a problem where a bridge takes two spots of water and i can't place a bridge in either spots, i also can't place a building onto the bridges where the bug is. 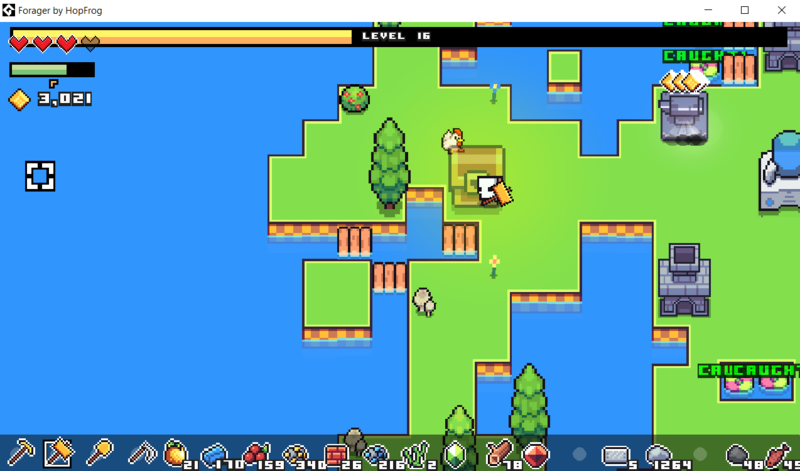 Seems the island cap is 12 even if the max islands in inventory states 69. After reaching 12 land owned I can no longer purchase any more. I always get a Fatal Error whenever i try to make the game Full Screen on my 4k Monitor. I had two fun little bugs today, the first was whenever I started a new game in the left-most slot, it spawned me in a blue room with nothing in it. 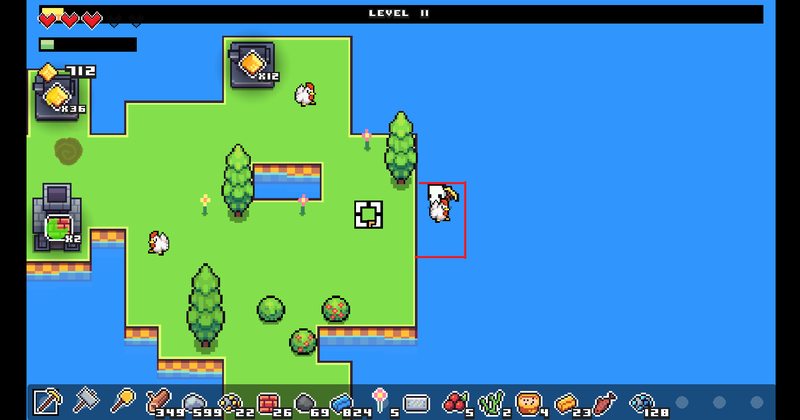 I could move freely, but no structures, elements or sprites were loaded besides my little dude. The second one was a double tree. Not that exciting, but it looks cool. Found a bug that does not allow me to purchase more land.... please help!! I have the same problem and it happen twice after i beat the dessert dungeon the price disappears and I can't advance in the game. When I run the game, it seems that I can't get past picking mouse or keyboard or controller, there is no cursor and when i use controller nothing happens just stuck on title screen please help! Hello, I am David Huynh i don't know if this is a bug but as soon i double click it say The procedure entry point CreateDXGIFactory1 could not be located in the dynamic link library dxgi.dll. When all i have is Languages Forager and Data that's it. I actually stopped being able to buy land after buying 30/49. Got one where a chest spawns on top of the player and the player can't move, looks like a clipping issue. After beating a galaxy puzzle chest items will not go to a vault, so if there’s no room in your inventory, you can’t get the items. In the rainbow puzzle if you build something on top of a mushroom e. g. a furnace, the mushroom won’t rescanned even if you break what you built. Also, late game some animals just don’t spawn; for me it was cows. These are just some bugs/things I found annoying. 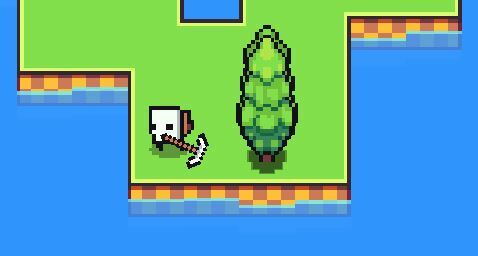 I played the demo of Humble Bundle and saw that on the edges of my land there was a frost tree that kept on giving wood. This error happened when I have gotten the supply skill for 4 extra slot in the market. After I got the skill, when I go click on the market, the game crashed. Happens everytime. I'm lvl 10 with max XP, but I don't level up. This is a limitation of the Humble Demo. I thought it would be cool if I built my market on a floating raft in between islands, so I built north from one of my islands, and placed the market on a raft 5x5 made of bridges. I then later remembered that you can buy land. I bought the island where I built my market, and it didn't destroy my market, and it's still functional, but I can move through my market as though there's nothing there. 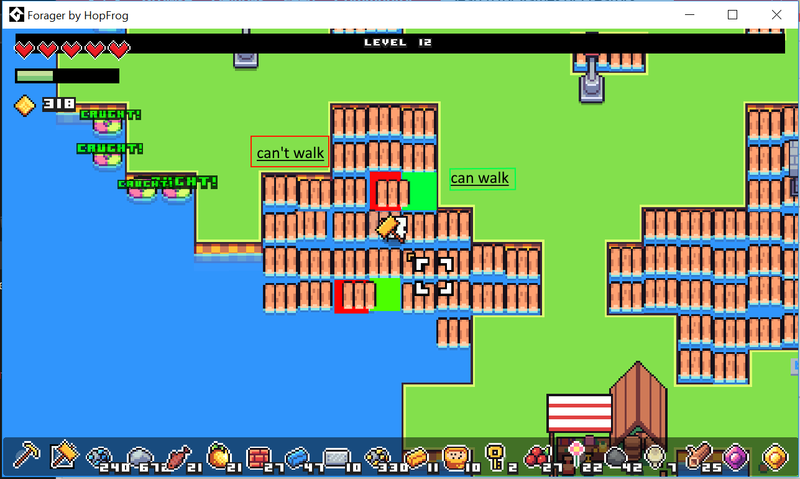 I'm not sure if monsters are implemented yet, but this seems like a potentially abuseable bug if I can walk through something, but NPCs cannot. This is from the Humble Demo version of the game. It seems if you die near the edge of the water, when you re-open the game there's a chance you'll have flown into immovable territory. 4. Reload. Be stuck in water. When I tried to download the demo and open it this error page came up......anyone else having this problem? What's the situation (I'm from China, so maybe it's slow to see, but I like this game very much, so please do me a favor, thank you). It won't let me actually send the bug report, it just freezes there. Another game crash as I'm trying to make the Robotic Shovel. As it completes the build, the game freezes and doesn't let me send a report. I have to CTRL + ALT + DEL to restart the game. ***EDIT*** Also when making the Master Gloves. Hopefully, you can get that figured out cuz I can't progress any further, which makes this unplayable. If there's some way of sending a bug report, please inform me how, thanks! As of Beta 8 the Ancient Galaxy puzzle tower is bugged for me. The blocks no longer electrify any of the nodes. I can't open the game, please help me. Can't seem to get the yellow shroom to show up. Anyone else? 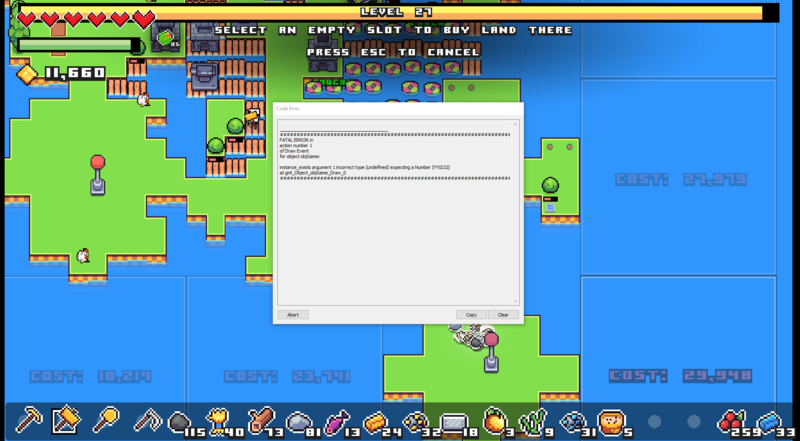 Mac, at level 40, after completion of skull maze I have received this fatal error and I cannot open the save game again. Let me know if there is anything else I can share to help identify any issue. I have played through level 65 and i was completying the museum, Then i realized i didn't have any milk. Then i realized that Cows and Berry bushes weren't spawning from when i was level 40 or something like that. I checked online and found other 2 reports of this bug. While aiming with a bow every light flies away and after shooting comes back.